Each year, the band has openings for a few musicians. If you are interested in becoming a member of the Burlington Municipal Band, contact Jim Priebe by telephone at (319) 752-7305 or by e-mail at bmbfoundation@muniband.org. The Burlington (Iowa) Municipal Band is a community concert band which has served and enriched the life of this city since 1927. The band's first concert was presented in Crapo Park in May of that year after the citizens of Burlington had voted for the implementation of the Iowa Band Law, a statute that allows cities to levy a tax “for the maintenance and employment of a band for musical purposes.” The city fathers of that time chose not to levy the tax as instructed by the vote, but to fund the band from the city's general fund instead. The city discontinued that funding in 2011 and the band is now supported by private donations through the Burlington Municipal Band Foundation. The band's roots extend back to the nineteenth century; it was formed through the combining of the existing Orchard City Band and the privately operated Fischer's Band under the leadership of J. Henri Fischer, a prominent musician of the era. The band today enjoys a membership from a wide variety of backgrounds. The band contains homemakers, physicians, music teachers, business men and women, ministers, retired people, college students, and a few outstanding high school musicians. All share the common enjoyment of playing their instruments and providing the community with a wholesome family activity. 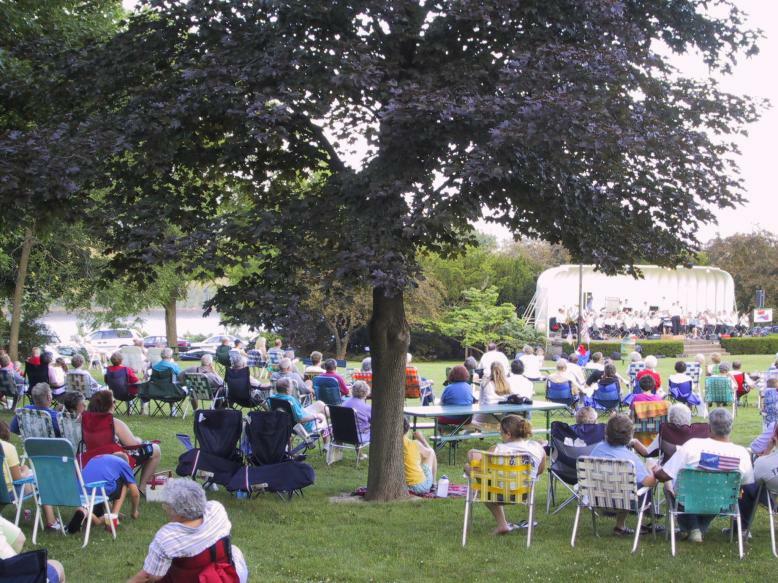 The Municipal Band performs free Sunday evening concerts in Crapo Park during the summer months. These concerts are presented from 7:30 until 8:30 P.M. at the Crapo Park Bandshell, located on Grandview Drive within the park. This site provides concert goers a magnificent view of the Mississippi River and the Illinois farmlands spread below, and a wide lawn where listeners can choose to sit on park benches provided near the bandshell, or bring their own lawn chairs or blankets, perhaps to sit near the illuminated Foehlinger Fountain. The concerts are well attended by people of all ages, and many visitors to Burlington make it a point to return each summer to hear at least one concert. This website is now maintained by members of the Burlington Municipal Band. We thank the staff at the Burlington Public Library for the original site design. This web site is also available in a LARGE PRINT version. We hope that you will take the opportunity to support live music provided by many musical organizations in the Burlington Area. Members of the Municipal Band participate in or direct many of these groups, and we would love to see you. These groups include the school bands, orchestras and choirs in Burlington and surrounding communities as well as the Southeast Iowa Symphony, Southeast Iowa Band, Bel Canto Chorale, South Hill Brass, Southeast Iowa Brass Quintet, and the Southeast Iowa Woodwind Quintet. You may often find band members directing or participating in the pit bands of the Players Workshop and/or area school musical productions as well. Feel free to sign our Guest Book! Welcome to muniband.org, the official web site of the Burlington Municipal Band of Burlington, Iowa! If inclement weather is threatening on concert evenings, you can check radar by clicking on the weather radar button below. If a concert must be canceled we will post that information prominently on this page as soon as that decision has been made. All concerts will be at the Crapo Park band shell at 7:30 P.M. The concerts are broadcast on KBUR AM 1490 via "immediate delay," from 9:00 until 10:00 P.M. on Sunday nights. We invite you to preview each week's concert for interesting information about the music and the conductor by clicking on the "This week's concert" button below. This information is normally available by the Wednesday preceding the concert. For even more updates and information, visit our Facebook page.